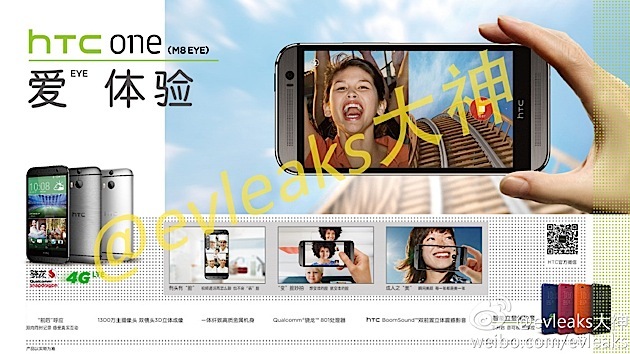 HTC Eye, or One (M8 Eye), should be a top of the range variant of the upcoming HTC that will waive the disputed camera to Ultrapixel to go instead to a more canonical 13 megapixels, but always accompanied by a second sensor to measure the depth of field and get an attractive bokeh effect . The Specs of the smartphone should remain more or less unchanged compared to One (M8) Snapdragon CPU 801, 5" Full HD Screen. However, we have the absolute certainty that this "Chinese clone" of evleaks has provided a render will be right or trustable, considering that seems more focused on selfie instead of the camera back, but we are not far from the official release of the device we hope to see HTC doing good again as they did with HTC One Series.